The Thirst Quenchers Rick Raphael Sci Fi. Book is in good condition, all pages intact. 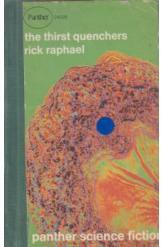 Four short stories by science fiction author Rick Raphael. Includes "The Thirst Quenchers," "Guttersnipe," "The Mailman Cometh," and "Odd Man In."